Look at what’s in the tree in our front yard! It’s a sad little excuse for a tree so I feel kinda bad for the poor little bird. 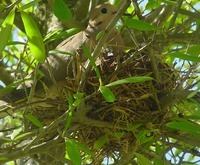 This one won’t leave the nest, even in the midst of weedeating around the tree. I provide this picture in hopes it will distract you from the lack of knitting content. There has been much knitting and much thinking about knitting and many knitting related things going on, I just don’t have any pictures of it. This weekend I started the Chicknits Cutaway Jacket with my new Knitpicks yarn. I love me some Knitpicks Merino Style. It really is so soft! I’m once again obsessed with a project and that’s a nice place to be. Aww…sweet bird pic! Can’t wait to see the Cutaway Jacket. Wow, the cutaway is cool. It really looks like you too! Pictures soon please! What color of the Merino Style did you choose? How are you finding the yarns quality to be?? I’m thinking of using the same stuff for Cutaway. I really like the Cutaway Jacket as well and have thought about making it…but I’m also trying to use up the two tubs of yarn I have under our bed! I decided to use it up for charity. A LYS in town has a group that gets together once a week to knit rectangles for a Warm Up America type blanket that they donate to a local hospice group, so most of my “tub” yarn is going for that. Then there’s lots of baby yarn that will go into baby hats for charity. Makes me feel good.